Have you ever met with a friend at a coffee shop? You know, the kind of visit where the conversation ebbs and flows between fond reminiscing, thoughtful silence, fulfilling laughter, and hard truths of life. They are those rare occasions where you can be vulnerable with someone who's on your side, even when it's hard. 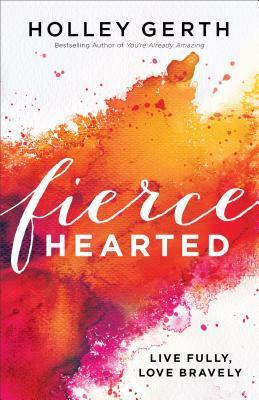 Fiercehearted is like one of those coffee shop packages wrapped up in between two covers. Holley's heart for the message she's sharing and its intended audience shines through on each page. With honesty and vulnerability, Holley bridges the gap between readers and author to share the lessons about leaning in and living a full life of love and kindness (which certainly isn't always nice) she has gleaned through her own journey. Holley's vulnerability in sharing her own past and struggles helps lend depth and credibility to her message. While the call to live fiercely can feel almost sermonized when shared in the wrong ways, Holley comes across as walking alongside. You get the impression that maybe, at times, both author and reader are sharing some tears. Yes, this book may invoke some tears. Holley lives out her message in the text going into topics that require some bravery and wrestling with hard emotions. Honestly, this is not a quick read if you want to get the full impact, this is a book to be read thoughtfully. I received this book as part of the Revell book tour. The opinions expressed are my own and uninfluenced.